NEW YORK - Nov. 26, 2016 - PRLog -- 'Tis the Season for The Fabulous Fezziwigs! The Fabulous Fezziwigs have been caroling since 1997! They are a caliber of Broadway community talent who are excellent vocal musicians. When they are out and about, even in the lobby of an office building, people gather around them, and they lead everyone in singing holiday songs. It's really delightful. It puts everyone in the Christmas spirit too! Shine My Inner Light Everywhere ~ after subbing in other caroling groups. Renae thought, "Surely, we can do better than this!" And they have. Hearing carolers can have such a resonating effect on people! For many, the spirit of the season doesn't take hold until they've heard carolers singing those old cherished songs. One year, while The Fabulous Fezziwigs were singing by the makeup counters in a department store, the store manager pointed out an elderly lady who frequently came to sit and just be near these cosmetologists. She was very rich, one of their best clients. She was also very sad. We planted ourselves near her and asked her what she wanted to hear. "Something cheerful?" we wondered. Nope. Not "Frosty the Snowman," not "Joy to the World." She wanted something soulful. Something to which it would be alright to cry. I suggested my favorite, "I Heard the Bells on Christmas Day." That was the one! We sang. She cried. She said it was the perfect gift, just what she'd needed. The Fabulous Fezziwigs celebrate with a Victorian touch with a quartet of carolers straight out of Charles Dickens' cherished "Christmas Carol!" The Fezziwigs reflect the festive spirit of Mr. and Mrs. Fezziwig, hosts of a rousing party in Dickens' classic tale. 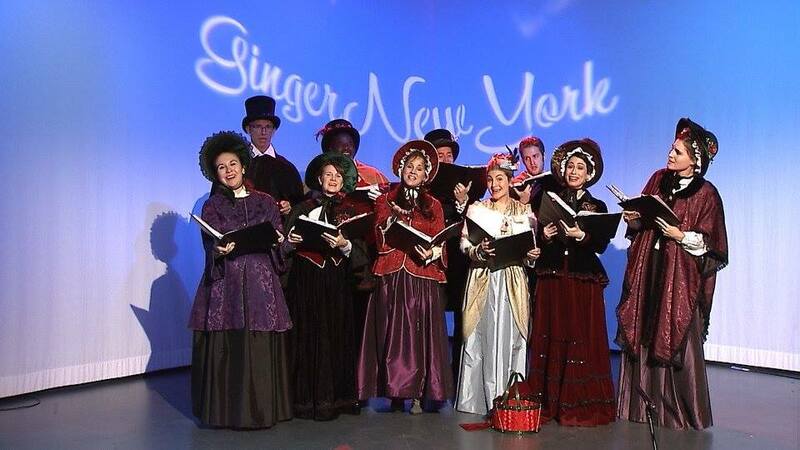 These talented singers, in gorgeous Victorian costumes, present songs of the season in a variety of formats, from traditional 19th Century carols to contemporary favorites. They can also incorporate multicultural themes, with Hanukkah songs and winter tunes! Many are original arrangements not found anywhere else, including an arrangement of "Auld Lang Syne" leading into "God Bless America" that can bring a room full of people together instantly! GingerNewYork can be seen in Manhattan on Time Warner Cable Channel 34 and HD Channel 1993, Fios Channel 33, and RCN Channel 82, every Friday afternoon at 2pm EST. It can also be seen live streaming on the Manhattan Neighborhood Network's website, www.mnn.org, Channels 1 and 5.